On February 26, 2008, Starbucks closed all company-operated Starbucks for a massive “hard reset” of baristas by retraining them on the perfect espresso beverage. For about three and a half hours, all Starbucks closed, perhaps causing the largest corporate-induced caffeine withdrawals in America’s history. 😉 Soon, brewed coffee will go through the same zenith level transformation, and it is only a shame that they wait until March 9, 2010 to officially have all stores up-to-speed with the Pour Over brew method. If they had launched the Pour Over nationally on February 26, 2010, they could have drawn the parallel that now brewed coffee gets its revitalization finally: Bold coffee offered as a single-crafted cup of coffee for each customer. Starbucks provided the stores with training materials, including one item with this following message (below) from Howard Schultz to Starbucks employees (employees are called “partners”). I’ve transcribed the Howard Schultz message, almost in its entirety below. Keep mind, that the excerpted message below was spoken, so all the punctuation and emphasis is my interpretation of what I listened to. You know over the years I’ve made countless videos to share with you one message after another and when I think about all the things that I’ve talked to you in the past about, I can’t think of a more important message than the one I’m about to share with you. And that is that you are in the midst of going through the transformation of the company in terms of our passion and commitment to ensure the fact that you have all the tools and the resources to not only make the perfect shot of espresso in every espresso-based beverage but to really understand what’s behind this and why it is so vitally important. And if I’m really honest with myself, I think that over the years we have not as consistent and as committed to ensuring the fact that the quality of the beverage was compatible and matched the quality of the coffee that we sourced and roasted. And what I want to make sure you understand is that this is not just about training; this is about the love and the passion and the commitment that we all need to have to the customer. Our customers are coming into Starbucks because they have a level of trust and confidence that we are sourcing and roasting the highest quality coffee in the world and they are going to get a perfect beverage. I think over the years we’ve kind of lost our way a little bit and talked about speed of service, USDs, and all the things that are important for the business but I think they’re out of whack. What’s really important – the most important – is that we exceed the expectations of our customers. And I’ve always believed the only way we can exceed the expectations of our customers is that if we could exceed your expectations and that is why we are investing in you, investing in this transformation so that we really get back to the core, to our roots, to the heritage, and to the tradition, and the romance of coffee: The love of coffee. And what I’d like you to do when you go through this is really not just go through the motions: Really embrace this moment and realize that that it is not about 100,000 partners. It is about one partner, one customer, one cup of fantastic coffee at a time. The business that we are in, and always have been, is that we are the leading roaster of coffee in the world in terms of quality, the precision, excellence, and that all comes to life when you hand that cup of coffee to the customer. So it’s been two years. Who remembers this, and what is their take on this now? Did it work? I think if nothing else, I think it re-connected baristas to the notion that “if your drink isn’t perfect, we will remake it for you.” I think that Starbucks had started to fall asleep at the wheel with respect to this message, and that this training session was the cornerstone to a larger piece of barista education: Yes, the drink IS important. It is each baristas’ individual responsibility to make the shot great, steam beautiful foam, and hand it to the customer with a smile. Discussion is welcome… This is an open thread. Feel free to comment on ANY Starbucks topic or this topic. On February 25, 2010, Starbucks.Com went through a complete site redesign – Store hours are now on the store locator, and the look and feel of the site is very different than before. That’s one more possible conversation topic! Starbucks tests the "Trenta" size cup. Starbucks unveils the Cinnamon Almondmilk Macchiato & Coconut Milk Mocha Macchiato (And a look at 1990 Espresso Beverage Standards). How Many Starbucks Aprons Do You Have? I took a partner survey today. It had a video which featured Howard repeating the same sentiment. I also hope this post makes sense. I’m very tired!!! I get what you’re saying Cam. It’s like a constant tug of war between “theater and romance” and “labor”. I think Howard Schultz is very authentic in terms of what he wants for the business, but I wonder if he really understands how dis-empowered the typical barista is in a modern Starbucks. Ah Espresso Excellence Training! As a Green Bean with the company it was a turning point in my career in the Coffee and Tea industry. The point that made me want to peruse this industry far beyond the walls of a 2nd wave café and into the culinary wonders of the 3rd wave world. For many, it heralded the end of Howard Behars Starbucks, which seamed to be a march toward a McStarbucks and further and further away from the company they signed on with so many years ago. A Renaissance to the fact that “a people company serving coffee” just wasn’t enough – the beverage mattered too! How excited we all were to tell our customers about the re-education and the higher quality that we should have, but now would be offering from this moment forward… but how soon that came to an end. With the markets collapse so soon after, the real owner/operators, the shareholders, who had already a taste of the larger dividends and soaring sock prices, exerted their right. In spite of the dreamers inspiring words on DVD and his triumphant return to the helm of his beloved company, the pressure was soon on back on the Store Managers to show healthy P&Ls. This stress dominoed to the Shift Supervisors who dumped it squarely on the shoulders of the Baristas. Faster, faster, faster was the name of the game and soon their was just little room for beverage excellence in a culture of assembly line-ism. When one gives pause and wonders on where Espresso Excellence would be today, we can’t help but wonder… would Starbucks be better off if she was not to found within the glossy pages of the Fortune 500… but rather the INC. 500? What I can give is my opinion as a customer, I hope this helps! How many once heralded “Espresso Excellence” standards have since been quietly thrown to the wayside? Shots always poured in shot glasses so that baristas could see the quality? Gone. Shot glasses rinsed everytime? Gone. Single shot option taken away because it lacked quality? Brought back! Some of these re-changes made with no such fanfare, but as if they never really mattered in the first place. But they DID matter, right? Remember the passion and imploring in Howards voice? I do. What changed? I think part of the problem, and it is a problem in a lot of corporations that experience high turnover and change, is that the appreciation for history does not seem to permeate their actions. Your blog seems to respect and have a much better sense of the Company’s history and values than Starbucks appears to show. They seem to be about “the next new” instead of tying it all back to the original experience. (reply to CD) – I’ve noticed that there is no Starbucks historian. I’m sure that Howard knows everything in his head, but there is no person who is actively acting as historian and blogging about it. ^ That is the perfect blog model for Starbucks but instead they create website after website (like clovercrafted.com) which is then hardly maintained by the corporation later. @ Sbsmooth I still pull most of the shots into shot glasses. I still rinse the shot glasses after each use. And yes, I always use the double shot button. I realize that as a barista at Starbucks I am responsible for each drink that I hand-off and that I have to make sure its right. Some people are very irresponsible persons like single mothers and the uninsured. I’ve been a long time patron of Starbucks and have to admit that I think the Espresso Excellence initiative helped it the “reset” button on not only quality in the cup, but the attitude towards customers. The baristas who I have the pleasure of interacting on a daily basis with are genuine and professional. I look forward to seeing them and it makes my day to be treated so kindly. The one thing that I wonder about is, how is this point of espresso excellence driven to the newer baristas? And with all the recent economic swings, layoffs and store closings in the years following the Excellence training what was lost or forgotten about…especially with less labor now. There was a comment earlier that mentioned turnover of baristas and I’m sure that is true…so what happens to the baristas that start and never had the experience of the participating in the training. I could see the baristas that were there really took it to heart because every Starbucks shutting down for 3 hrs was absolutely huge…and that must have struck a chord. I just hope there are baristas that still remind others of this to ensure the message and quality is not lost, 2 years later. I pulled the original espresso excellence memo out of my partner file last weekend, re-read it, and laughed out loud…. store managers tasting steamed milk and espresso on every shift! District managers on every visit! Like that ever happened. Remember, this was before Cliff Burrows, our LEAN machine in chief. I think it would make a great topic of discussion at the shareholders meeting, though. Why aren’t shot glasses important? Why is the single shot OK to serve now even though it tastes just as crappy? Ten second rule? Out the window. It was really insulting for us baristas not only to be left unsupported in the months following the meeting in terms of holding each other accountable, but then for the company to go about quietly reversing everything we were told… as if it really didn’t matter that much anyway… Starbucks has done a lot to lose my trust the last few years, but the reversal of espresso excellence is by far the most insulting. We are the coffee megalith, but not the coffee leader. Also, Melody, I take issue with your characterization of how the pour over is being implemented. No extra training hours are being given and the pour over is not going to be advertised to customers as a brewing option — its just being introduced as an afternoon coffee shortcut, nothing more…. a hard reset, no, not even close. (Reply to BayAreaBux) – I probably did overly romanticize and spin the launch of the Pour Over. It just has SO much opportunity to be more, and I’m hoping that Starbucks will see that with a little time. It’s quantity, not quality. Our DM just informed us our customer wait time is too slow, and our friendliness is too high–he recommended we be less friendly. The only things that are important in our district/region are speed of service and QWASA–forget quality. Ugh, see its direction like that above that saddens me and questions how the Esp Excl stuck. For a DM to say be less friendly, when one of the core components 2 yrs ago was connecting with and engaging the customer. I don’t think it as fault of the baristas, i know they want to connect but they are directed a different way. There does need to be a balance of “friendliness” and “wait time” though – there’s no use charming the pants of the customers if they’re waiting 5+ minutes for a drink. SBUX:AU has the highest hourly labour costs in the world, and also the highest ADT (customer count) in the world too. This causes significant labour challenges in-store, where connecting happens while customers are waiting in line, or while receiving their drink. I appreciate Howard’s sentiments, but I’d imagine it’s still very difficult to balance the “love of coffee” with the fact that Starbucks has grown so large that it needs to tailor its products and services (and the speed at which it offers its products and services) to the masses, most of whom do not have a sophisticated coffee palate. I’m not sure that, now that Starbucks is so giant, it will ever be about the “love of coffee” again. Certainly not in its major stores, to say nothing of the ones in grocery stores or book stores, etc. It seems like only 15th Ave and Roy St really still feel like they are truly about the coffee. In regards to ‘theatre and romance’, I was a little frustrated when Starbucks started pulling espresso shots directly into paper cups. Theatre and romance? NONE there. Quality control? None there either. For the life of me I cannot understand why that change was made. Unless a customer is drinking a solo espresso, there’s no way that they could notice the slight loss of crema with the use of shot glasses. Quality control is way more important. We’ve started the pour over at our store– no real training though, not even a store meeting :-/ Basically, we’ll just be using it to brew cups of decaf and that’s just to cut down on how much decaf we dump. We sell very little decaf. Most of the time when someone request a decaf coffee they are asked if a decaf Americano is ok and if they say yes they are just charged for a decaf coffee. Most people ask, “What’s an Americano?” The pour over is time consuming. I’m not sure customers are going to be happy about that and I’m sure baristas who are also trying to warm sandwiches, keep up with brewed coffee on the 8-minute cadence, keep the pastry case stocked, keep the condiment bar clean and stocked, etc., etc., etc. are going to be too happy about it either. 1. @Sbsmooth: All the things Starbucks asked, pleaded for us to do have gone by the wayside. In my opinion, they have gone by the wayside PURELY as a cost-saving measure. 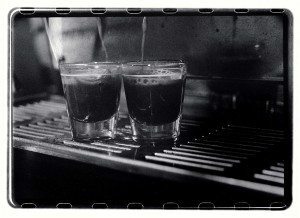 I specifically remember reading that we should pour shots directly into the cup for “quality reasons.” However, Starbucks also happened to mention that because the motion of removing and replacing shot glasses has been eliminated, the labor we were receiving for espresso drinks would be reduced. What I’ve noticed, at least at my store, is that even though pour over takes significantly less time than brewing a quarter batch of coffee, people are still unwilling to wait, and opt for an americano. Which is a shame, since when it’s busy, the time you spend waiting for an americano in the drink queue is probably about what you’d wait for the pourover. I agree with you in regards to the old C.O.W. system. There did seem to be a lot less complaining about the coffee because it was always rotating. There always seemed to be new and exciting. @Melody once mentioned a compromise between the old and new: 45 minute hold times. It’s not as bad as holding for an hour, but not significantly longer than 30 minutes. What if we had 45 minute hold times in the afternoon? I work at a relatively high-volume store and in the afternoons, we can go hours without serving a cup of coffee. I remember the “espresso excellence” training; at our store, we still pull double shots and still rinse shot glasses religiously. The whole “can’t pour shots directly into the cup” got ignored pretty fast, but we still time shots to make sure they’re good. Damien made an excellent point: it’s great to take time to ensure each drink is utterly perfect and to spend plenty of time connecting with the customer, but at the same time, people do want to get their drinks sometime that same day. I work at a drive-thru Starbucks. Let’s say someone pulls up to the window to pay and get their drink, and I start chatting with them. I get into a nice conversation with them – we talk about the weather, how their kids are doing in school, the local sports teams, etc. Awesome! I’m connecting with the customer! That’s what Starbucks is all about, right? Know what the people in the lobby are thinking? “Where’s my drink? This is taking a long time!” Know why they’re thinking that? Because I’m off “connecting with the customer”…to the utter neglect of every other customer. The root problem is labor. To do my job, I have to be in three places at once, because there’s no one else to do the things that need to be getting done in those three places. I’m forced to choose between not connecting to the person immediately in front of me so that I can make sure everyone gets helped, or taking plenty of time on the person in front of me and making everyone else suffer. So yeah, there has to be a balance between doing all of this coffeehouse romance and pagentry and ensuring that the customer is served in a timely fashion. Which is a shame, because I’m happiest when business is slow but steady and I do have time for all of the coffeehouse romance without having to rush off to help the next person, make the next drink, solve the next crisis. I understand what you’re saying, but just want to clarify. The root problem isn’t labor, it’s the cutting of labor hours. Management’s constant desire to cut labor to save money for shareholders, rather than focusing on the customer experience, is the biggest issue I have with this company. I wish this was Facebook, so I could hit the “Like” button on your post. Spot on. Well put. I honestly do believe Howard in the video. If he were my district manager then I would feel completely confident in the direction of this company. The problem? There are like 12 greedy buttholes directly inbetween him and I. Like a bad game of telephone I think his message will get diluted back into my DM bullying his way into VIA sales so that he can get his bonus.